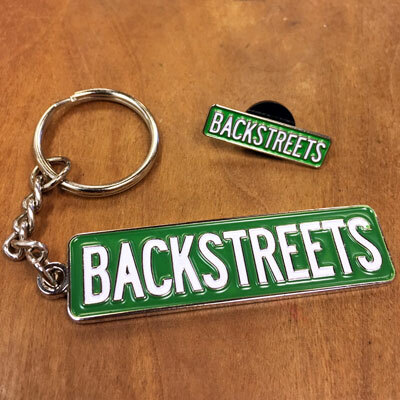 Thanks to our friends at Print Mafia for custom making these Backstreets items for us. Save $2.50 when you order the pin and keychain together in this bundle, normally $10 each. The discreet 1-inch enamel pin is made of iron, features green and white enamel, and comes with a sturdy rubber back closure. The solid iron keychain, measuring 2.25" in length, is nickel-plated and comes with a sturdy ring to hold all your keys. Small embossing on the back reads "est. 1980 backstreets.com."